Another University of South Carolina Baby Quilt! We love checkerboard quilts! 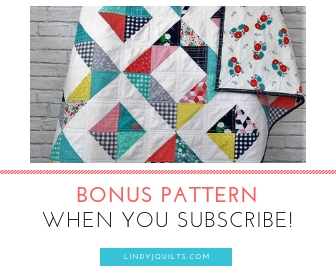 We over-calculated the fabric yardage and WAY over-cut 2 ½” strips on our first South Carolina Baby quilt, so we created another one but used a 9-Patch unit as opposed to a 16 patch unit. We had a lot of fun laying this one out and trying out all kinds of patterns. In the end we settled on grouping the black and burgundy squares and framing them with the white squares. Although we used a lot of prints, the pattern subtly emerged. We ditch-stitched this one to create an allover 2” grid. The back and binding are Blueberry Park Lib Stitches in burgundy. We are now rolling with the machine binding (YAY!). Mom has come up with a method that ensures the stitches catch the back side while staying straight and in-line. It involves pinning AND hand basting the binding in places, but it’s worth the extra step. The binding is very professional looking now!! Pre-washed with color catchers and Retayne so that the quilt will be bright without color run. We have listed this quilt in our Etsy Shop. It is a very manageable size for an infant tummy time mat, toddler quilt or picnic/tailgate blanket. Thanks for stopping by our blog – A new Quilt Top is coming soon!